Tindouf, also written Tinduf (Arabic: ولاية تندوف‎), is the westernmost province of Algeria, having a population of 58,193 as of the 2008 census (not including the Sahrawi refugees at the Sahrawi refugee camps). Its population in reality could be as high as 160,000 because of the Sahrawi refugee camps. Despite the barren landscape, Tindouf is a resource-rich province, with important quantities of iron ore located in the Gara Djebilet area close to the border with Mauritania. Prior to Algerian independence, the area served as a strongpoint of several tribes of the nomadic Reguibat confederation. The town of Tindouf was rebuilt near an isolated Saharan oasis in 1852 by members of the Tajakant tribe, but sacked and destroyed by the Reguibat tribe in 1895. It remained deserted until French troops led by colonel Trinquet arrived in the area in 1934 and attached the region to the French Algeria territory. The province houses army and airforce bases for the Algerian military, and is strategically important due to its proximity to the Moroccan border, and its location at a four-country border crossing. From independence in 1956, the Kingdom of Morocco claimed the Tindouf area and western Algeria as part of Morocco. These claims are based on the allegations that until 1952, Tindouf was part of French Morocco and was administratively attached to Agadir, and promises made by parts of the Algerian underground during that country's war for independence. After Algeria's independence in 1962, Morocco's claim to Tindouf was not accepted by the new Algerian republic. This led to the 1963 Sand war, fought along the Moroccan-Algerian border in the Tindouf region, and also involving Béchar Province and Tlemcen Province, after Morocco claimed the area as its own following Algerian independence. In a process beginning in 1969 and finalized during the OAU summit in Rabat in 1972, Morocco recognized the border with Algeria, in exchange for joint exploitation of the iron ore in Tindouf. However, parts of Moroccan society and some nationalist political parties still refer to the Tindouf area as historically Moroccan territory, and the Moroccan parliament has still not ratified the border recognition. From 1974, refugees from the contested Spanish Sahara started arriving to the Tindouf area, following an earlier wave from the 1958 unrest. This turned into a major exodus from 1975 onwards, when Morocco and Mauritania seized control of what was then called Western Sahara, and Algeria retaliated by allowing the Polisario Front, a nationalist Sahrawi movement, to use the area as its main base. 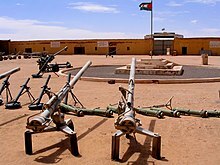 Sahrawi refugee camps were established in 1975-6 here. The Polisario remains in the province, running the large refugee camps located south of Tindouf city. The European Commission refers to the Sahrawi refugees as the "forgotten refugees". The province contains one daïra (district), Tindouf, which is coextensive with the province. The province and daïra has a population of 58,193 inhabitants. The daira is further divided into two communes or municipalities: Tindouf and Oum El Assel. It is the only province in the country which has only one daïra and it also has the fewest communes. ^ Sahrawis are not legally recognized as dwellers of the province but rather as illegal or temporary refugees and migrants in Sahrawi refugee camps. Their exact number is unknown. ^ a b c Office National des Statistiques, Recensement General de la Population et de l’Habitat 2008 Archived 2008-07-24 at the Wayback Machine Preliminary results of the 2008 population census. Accessed on 2008-07-02. ^ Dunn, Ross E. (1977). Resistance in the Desert: Moroccan Responses to French Imperialism 1881-1912. Croom Helm. p. 110. ISBN 978-0-299-07360-2. Retrieved 22 July 2012. ^ Institut des hautes-études marocaines (1930). Hespéris: archives berbères et bulletin de l'Institut des hautes-études marocaines. Emile Larose. p. 46. Retrieved 22 July 2012. ^ Trout, Frank E. (1969). Morocco's Saharan Frontiers. Librairie Droz. p. 155. ISBN 978-2-600-04495-0. Retrieved 22 July 2012. ^ Trout, Frank E. (1969). Morocco's Saharan Frontiers. Librairie Droz. p. 318. ISBN 978-2-600-04495-0. Retrieved 22 July 2012. ^ Cordesman, Anthony H. (2002). A Tragedy of Arms: Military and Security Developments in the Maghreb. Greenwood Publishing Group. p. 57. ISBN 978-0-275-96936-3. Retrieved 22 July 2012. ^ Barakat, Halim Isber (1985). Contemporary North Africa: Issues of Development and Integration. Croom Helm. p. 140. ISBN 978-0-7099-3435-6. Retrieved 22 July 2012. ^ Zoubir, Yahia H.; Fernández, Haizam Amirah (27 March 2008). North Africa: Politics, Region, and the Limits of Transformation. Taylor & Francis. p. 247. ISBN 978-0-415-42920-7. Retrieved 22 July 2012. ^ Gordon Harris (1994). Organization of African Unity. Transaction Publishers. p. 26. ISBN 978-1-85109-124-9. Retrieved 22 July 2012. ^ United Nations Publications (30 May 2004). Reports of Judgments Advisory Opinions and Orders: 2001 Bound Volume. United Nations Publications. p. 213. ISBN 978-92-1-070980-4. Retrieved 22 July 2012. ^ Council on Foreign Relations (1979). Foreign affairs. Council on Foreign Relations. Retrieved 22 July 2012.